​Commuting in New York for most people is not the most glamourous or quick process. I always look at it as the “luck of the draw” who is on the same train car as me. About 80% of the time either I am running late, or my train is running late, and therefore my day starts with power walking and then results in sweating. I am very envious of all of the people that live in the city close enough to work, as they are able to just take a light stroll outside to get there. Sweating at your desk when you get in is just not something you want. Do to this, I always dress in layers. Even if it is a little chilly outside, I know in a few minutes I will regret wearing that jacket. I chose to wear an Xhilaration maroon velvet jumpsuit, and paired it with a leather jacket that is a size larger than usual. Because it is a little larger, it makes it easier to drape the jacket over my shoulders. At the end of the day what I love about working in Brookfield Place in the financial district is the view. We stayed after for the restaurant inside, and watched the sunset. You know you truly are blessed with the best when your co-workers become some of your greatest friends. Click image to shop hundreds of styles! 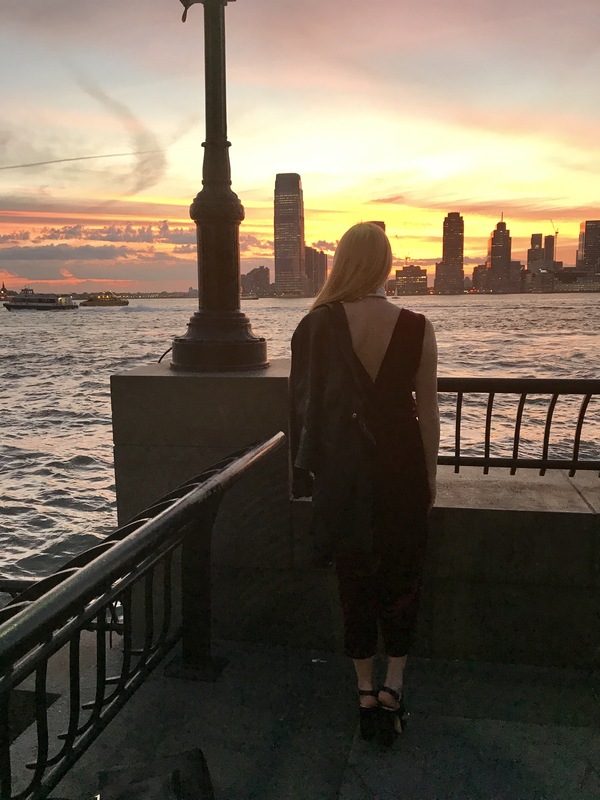 Megan Quist is a Minnesota-based fashion blogger living in NYC and founder of Megan & Manhattan.